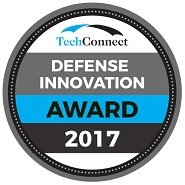 We are proud to announce our selection as a 2017 DefenseTechConnect Innovation Awardee. Only 15% of all innovations submitted to the Defense Innovation Summit (DITAC) were selected for this Award. Rankings are based on the potential positive impact the submitted technology will have for the warfighter and national security. To learn more, visit: http://defenseinnovation.us. Detector stack, consisting of two(2) 14 pixel semiconductor modules with Li-6 sensitizer layer sandwiched between two barrier layers.